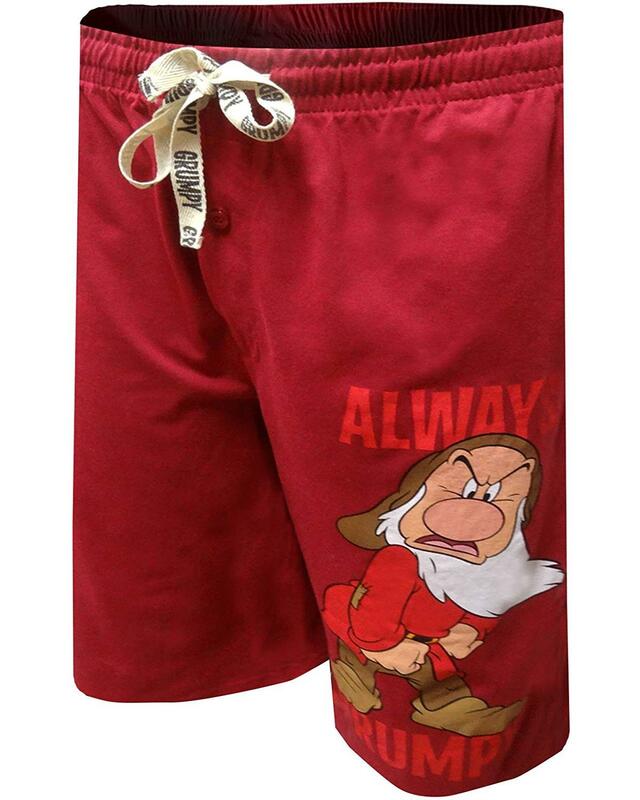 Super comfy Lounge shorts featuring Grumpy from Snow white and the 7 Dwarfs. Let everyone know your mood before you even speak with these grumpy red shorts complete with convenient pockets. Super comfy Lounge shorts featuring Grumpy from Snow white and the 7 Dwarfs. Let everyone know your mood before you even speak with these grumpy red shorts, complete with convenient pockets. Soft poly-cotton blend fabric, comfortable length, button fly, elastic drawstring covered waist. Officially licensed, great use as lounge wear. Adjustable drawstring tie.Button fly.Covered waistband.Two Pockets. • Officially licensed, great use as lounge wear. • Super comfy Lounge shorts featuring Grumpy from Snow white and the 7 Dwarfs. Let everyone know your mood before you even speak with these grumpy red shorts, complete with convenient pockets. • Soft poly-cotton blend fabric, comfortable length, button fly, elastic drawstring covered waist. • Adjustable drawstring tie.Button fly.Covered waistband.Two Pockets.